It’s November and getting towards Christmas. 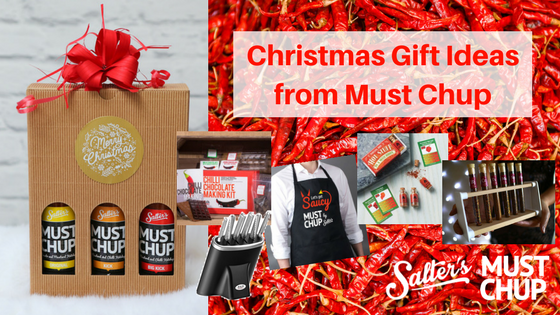 Here at Must Chup we’ve done some of the hard work for you and come up with a list of presents for your chilli lovers and foodie friends and family. Prices range from stocking fillers to investment pieces so there’s something for everyone. If you’d like some of these we suggest ordering soon to ensure they are still available and also to allow time for any personalisation. Experiment with some hot hot hot chillis (£24.95) and several other chilli gifts here including the Little Book of Chillis. How about a new saucepan or knife set? Or a personalised chopping board or spice rack? 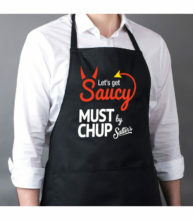 And our Must Chup apron complements them perfectly. 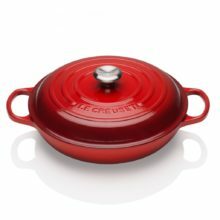 Le Creuset have a great selection of different saucepans and dishes including a cerise rectangular one (£39). There’s one to suit lots of different price brackets and this shallow casserole would make a wonderful gift for a special person. It’s an investment (£179) but will last for years and it’s versatile so it can be used for stir fries, baking and as a serving dish. A reasonably priced knife set from Von Shef (£34.99 at Amazon). A personalised end grain chopping board to use with the new knife set (£99) and lots of other ideas for personalised presents here. How about a vegetable box delivery from Abel and Cole? If you’d like to buy some of the Must Chup sauces in person it’s available at lots of local suppliers. Take a look at the map on our website here.